2BR House Vacation Rental in ?? ?, ??? 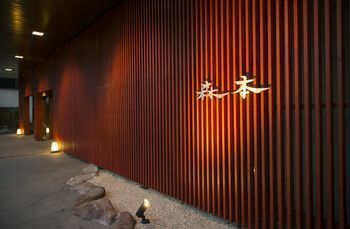 Best location in central downtown Kyoto! 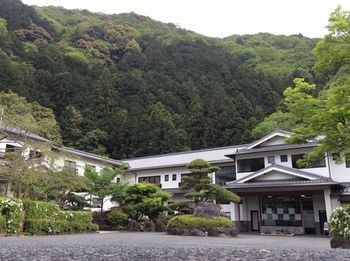 Perfect for couples, families, families traveling with children, and business travelers who are looking for a special experience in a beautiful Japanese home. The property is 46.64 square meters, has cozy bedrooms and a clean dining area! Only 5 mins to Kyoto traditional visiting area like Nijo Castle and main station area with pocket Wifi!! Perfect location for sightseeing and your night life too. Easy walking to Nijojo-Mae Sta with pocket Wifi !! Kitchen and Restroom is very beautiful because it puts new equipment. The room is a clean and cozy house. 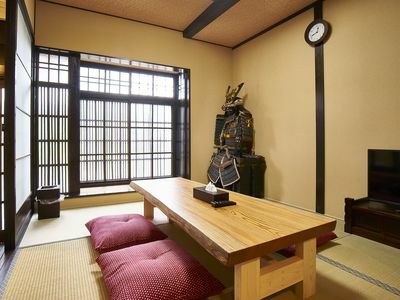 The room has comfortable beds and futons with Tatami floor and wide dining table set. The room comes with "free pocket Wi-Fi" so you can carry it to access Internet wherever you go during your trip. Of course tons of restaurants and bars since it's close to Kyoto main area!! I will be always online so you can talk to me through Email or call me for any support. 5 min walk to Nijojo-Mae Station. Thank you for visiting my listing. 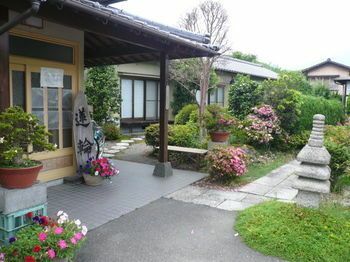 This is a house for those who like staying in Japanese style with tatami, feeling comfortable during your stay. 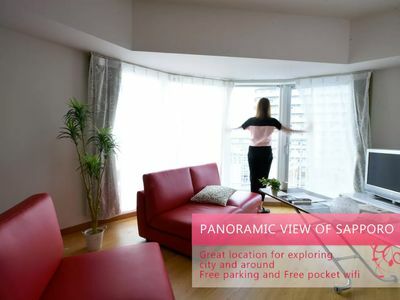 It is located near Kyoto Station so you can access every famous location easily and quickly. There are 2 main bedrooms for you. You will see the beautiful sunset on a sunny day from the west bedroom and the shiny sunrise from the east bedroom. With extra futons, a total of 5 people can stay in the same house. It is a private house, not a hostel or share house. You will be the only guests here during your stay. Feel free to use everything as you like. Kitchen, washers, fridge, toilet... it's all yours! 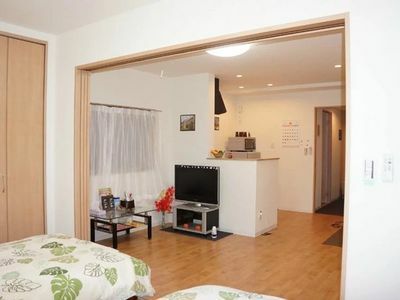 The kitchen and tatami area also fully equipped with traditional appliances. Check In and Check out time is strict since we have many guests coming in and out especially during peak seasons. You are welcomed to message me and request an early check in or check out time, and I can see if I can provide that for you. Hi, I'm Rio I usually live in Kyoto and in Osaka for work. I am in Osaka for about a half of the week. I like watching movies and playing sports. Also, I've been to Osaka many times. I've had tones of family and friends over to visit so I've been all over from Hokkaido to Okinawa more times than I can count. I know the best tourist spots all over Japan, and I also have my own special favorite sites, restaurants, and tips which I'm happy to share. If you need any help organizing your trip, I'm your man! This house is near from the main road, and only 2 minutes walk from the train station. Q. Will there be other guests share the accommodation at a time? A. During your stay you will be the only guest staying in this house. It is private and you will have your own key, so you can come and go as you please. Easily access wherever you want!! Then, there are the hub of bus services in Kyoto. The services will take you almost any famous landmarks, temples and shrines. After you mail me I am happy to keep the apartment for you for 24 hours while you make your decision to stay. If I receive an inquiry from another guest during that time I will mail you to let you know. At the end of 24 hours I will accept the first guest to book the room. Please keep contact with me even if you lose chance to get my listing and I will give priority over you next time. HomeAway is built on mutual trust and friendship, so help me get to know you. Before you come to stay with me please make sure you add a few verifications to your account and add some personal information to your profile. = What do you love? = How do you spend a relaxing afternoon? = Where would you go on your dream holiday? I usually reply to emails within a few hours, and I'm happy to answer all your questions before you finalize your decision to book. I'm looking forward to hearing from you, so go ahead, click the button and contact me now! The house is located very close to Nijojo-Mae Sta. (Only 5mins! )and bus stop(within 3mins!) so you will easily find a lots of unique shops, department stores, restaurants and bars. It is a private house, not a hostel, share house, or hotel. You will be the only guests here during your stay. Feel free to use everything as you like. Kitchen, washers, fridge, toilet... it's all yours!